We’re thinking about a kitchen makeover for our home. I’m a huge fan of dark wall colors, but have never really considered them for my kitchen. In fact, I’ve never done anything to the kitchens in any of my homes. Which makes no sense since I cook almost every night. That’s a lot of hours in a room that has no visual appeal. 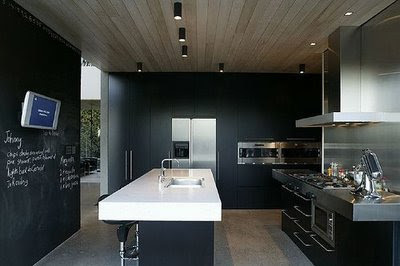 This fabulous modern kitchen in black really has me thinking about going dark. I love that there’s nothing on the walls. Trying to clean grease and dust of anything other than my stove and counters is more than I can handle. But the chalkboard paint allows for some creativity without extra dusting. And I love that white marble island. See more dark kitchens on Girl Meets Glamour.